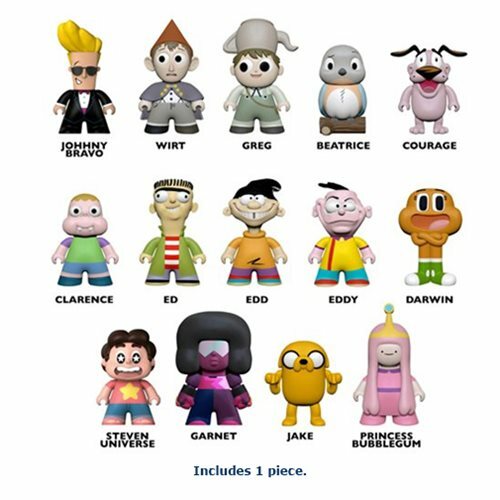 More of the beloved Cartoon Network characters have been imortilized as Titan viny figures! Wave 2 features favorites from Over The Garden Wall, Ed, Edd & Eddy, Adventure Time, Clarence and more! Each mini-figure measures approximately 3-inches and comes blind-boxed. There are even hidden chase figures for you to hunt and collect! Please note: This item may have variants randomly inserted throughout the production run. We cannot accept requests for specific variants, nor can we accept returns on opened items. The item you receive may be different from the one pictured. Ages 15 and up.